Railpictures.ca - Jacob Patterson Photo: After switching Traxxside Transloading, PDI Massey and the OSR/GEXR interchange, OSR is seen returning southbound at Woodlawn Rd in Guelph with veteran CP power (You can’t go wrong with the OSR!). This day’s job would work PDI Elizabeth and other industries before heading home to the junction. | Railpictures.ca – Canadian Railway Photography – photographie ferroviaire Canadienne. Caption: After switching Traxxside Transloading, PDI Massey and the OSR/GEXR interchange, OSR is seen returning southbound at Woodlawn Rd in Guelph with veteran CP power (You can't go wrong with the OSR!). This day's job would work PDI Elizabeth and other industries before heading home to the junction. 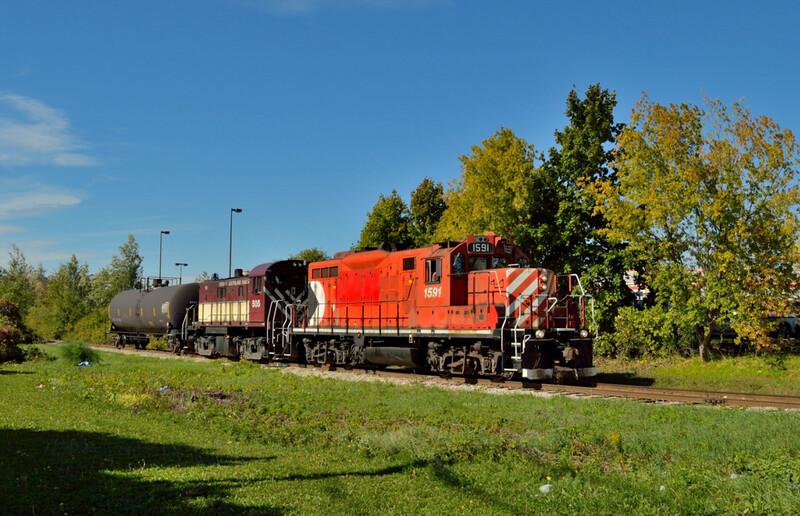 Excellent photo showing the crew enjoying a really beautiful fall day as they go about their switching chores. Nice having the 1591 leading.